Landscape photographer Joe Cornish features in a new documentary, tracing his path from coast to coast across the north of England. The 60-minute documentary, With Landscape in Mind, is produced by Light and Land and Environment Films. The film follows the photographer as he makes a trip across the north of England, travelling through the Yorkshire Dales and Lake District. The film isn't intended as an instructional video, but Joe imparts a number of landscape photography tips and how he approaches his work as a professional landscape photographer. Joe offers technical advice, inspiration and commentary on his surroundings. The documentary is sponsored by Lee Filters, which produces the filter systems that Joe uses to create his landscape images. Although Joe is better known for using large format cameras, he also usually carries a Canon PowerShot G11 with him. Speaking at an event in central London to launch the DVD, Joe said that as well as using the G11 as a visual notebook, he sometimes uses it to take images that he later prints at up to 24inches in size. He always shoots in raw format for the extra data and control over sharpening, saying 'I can't stand oversharpened images'. When working with the G11, Joe often uses a Lee Filters RF75 Rangefinder Holder System, which enables him to use neutral density and graduated neutral density filters with the compact camera. The ability to hold back the exposure of skies is particularly important for landscape photographers. Light and Land was founded by landscape pro Charlie Waite and sells photography books, DVDs and photo tours. Environment Films will be producing more films about photography and photographers in the coming months. 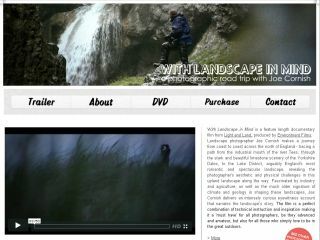 The DVD is available for £20 from the With Landscape in Mind website, where you can also find more information and watch a trailer.